Or, should I say, something that grabs our attention, since ‘fang, v.’ is an old word meaning ‘To lay hold of, grasp, hold, seize; to clasp, embrace.’ It’s labelled arch. or dial. in OED2, but survives in ‘newfangle’, ‘newfangled’, fairly unnewfangled words, having been in use before Chaucer was born (and used by him, after). But back to the list. 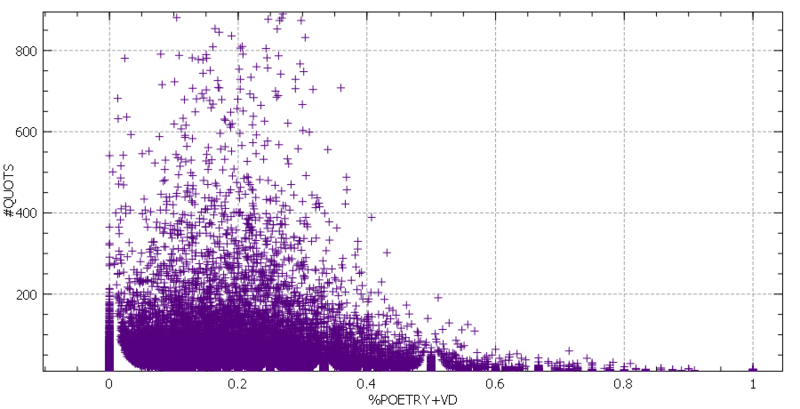 In addition to observing the seeming predominance of negative affect words, it’s apparent that many of the words are, like ‘fang, v.’, quite old, which may account for some of the bias toward poetic evidence in OED2, since the farther back you go, more and more of the available evidence is from poetry (there were no novels or newspapers to illustrate 10thC uses of ‘strew’). But even though all the words in the list are first recorded before 1350, and all but ‘rage, sb.’ come out of Old English, several continue to be fairly common and not generally regarded as particularly ‘poetic’. I’m surprised by some of this. The proportion of poetic quotations for ‘up’, ‘must’, and ‘us’ (we can ignore ‘May’ – the COCA count is for another part of speech) is almost three times the average for all quotations in OED2, and almost seven times the average for all OED2 headwords. Other observations are that while negative affect words continue to show up (sorrow, weary), there are more positive ones (rosy, dear, soft). And we’re starting to get a few more Latinate words (rosy, subtle, urge) as well. So, what is the most poetic word in English, according to the OED’s compilers? On numbers alone, ‘worse’ is the clear winner, with ‘fang, v.’ disqualified for archaism. But surely at some point the COCA count must work against a word in this kind of contest – it can’t be ‘up’, surely.